One day might not be enough to see all of Copenhagen, but you can still squeeze in a great first taste of the city, checking out the best neighbourhoods, restaurants, and night spots. If you’ve only got a short stay, here’s how to make the most of a mere 24 hours in Copenhagen. In summer months, get in an early-morning workout with a swim in the harbour. There are four harbour baths is Copenhagen, all run by the city. They are open all summer from 7am and are popular with locals. Post-swim, fuel up for the rest of your day with breakfast at Café Lillebror for breakfast. They do great bread and cakes, and the coffee is awesome. It’s owned by the same guys who runs Restaurant Bror, just around the corner, and who used to work at Michelin-star Noma. They open at 8am on weekdays, and 9am on Saturdays. The Freetown of Chirstiana is always worth a visit. This self-proclaimed autonomous neighbourhood falls under its own laws and regulations, and has been the subject of much controversy over the years. Stay away from the busier parts and go explore the many beautiful buildings, have lunch at one of the cafés, or walk a bit further to Copenhagen Street Food, where you find great food and seating outside with a view of the harbour. From Café Lillebror to Christiania is a 30-minute walk, or you can go to Nørreport St. and take the Metro to Christianshavns Torv (two stops). 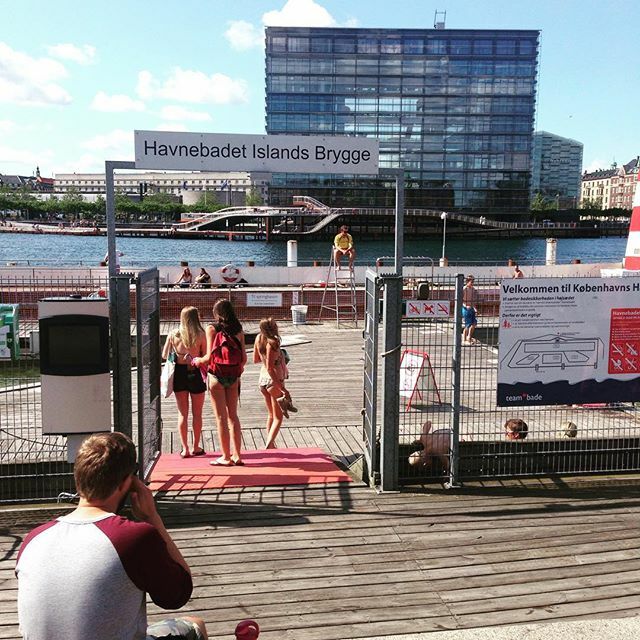 Depending on where you went swimming, you may be able to catch the harbor bus 991, and get off at Knippelsbro. Then, beat the crowds with a morning visit to the National Gallery of Denmark and delve into 700 years of art and art history. Experience art ranging from the early Renaissance to cutting-edge contemporary. It’s free admission to the museum’s permanent exhibitions. The National Gallery is a 10-minute walk from Café Lillebror. If you went swimming, catch the harbor bus after your morning swim, and get off at Nyhavn — from there, it’s a 15-minute walk to the museum. Have a traditional Danish lunch at Restaurant Schønnemann or Aamanns. Restaurant Schønnemann serves up the best traditional open-faced sandwiches in Copenhagen (book well in advance), while Aamanns offers a more contemporary take on traditional Danish food, based entirely on local produce. Or grab a hot dog (or two) from one of the many hot dog stands around town (there are more than 60 of them throughout the city!). The grilled sausage hot dog with everything on it is the most traditional version. Restaurant Schønnemann is located in the centre of Copenhagen and is a 15-minute walk from the National Gallery. If you are in Christianshavn, take the metro to Nørreport. Aamanns is just next to the National Gallery (if you are on Christianshavn, take the Metro to Nørreport and walk for 10 minutes). Take a walk around Nørrebro, the most diverse and urban neighbourhood in Copenhagen. There are great places to hang out, from fun, small shops to excellent restaurants. There’s great shawarma to be found in this neighbourhood, too. To get here from your lunch break, go to Dronning Louises Bro and make your way out to Nørrebrogade. Explore the area around Elmegade, then go to Jægersborggade. All in all, it’ll be about a 20-minute walk. Spend your evening exploring the meatpacking area, an area that used to house butcher shops and slaughterhouses. Some of them are still there, but most of the district has been converted into restaurants, bars, and art galleries. The area is also, a great example of early functionalistic architecture. To get here from Nørrebro, take the S-train at Nørrebro St (line F), change at Flintholm (line C), and go to Dybbølsbro St. It’s right around the corner. The train ride should take about 15 to 20 minutes. Don’t have time for a full 24 hours in the city? No worries, we’ve got the speedy version for a shorter layover. You’ll need about five to six hours roundtrip, but it can all be done via the public metro. If you’re in Copenhagen in the morning or early afternoon, take the metro from the airport to Christianshavns Torv (it’ll take about 20 minutes to reach the city centre). Walk across the Bridge to the Castle Island, and from there make your way through the small streets of medieval Copenhagen before ending at Nørreport St., where you can grab the metro back to the airport. Your walk will let you experience castles, the historic inner city, and Copenhagen’s small, cosy streets. If your layover has you in Copenhagen in the evening, take the metro to Nørreport St., where you’ll get to experience the city’s most diverse neighbourhood. Have a drink in one the great bars on Blågaardsgade, eat a kebab at Ahaa, or dine on Thai food at Ranee’s on Blågaards Plads. To get back to the airport, make your way to Forum St., where you can hop back on the metro. And if you’d rather see Copenhagen with a local by your side, jump on on of our Copenhagen city tours!